I was on a holiday trip and it was for my 40th birthday. I am from Paris, France. Yes was the highlight of my trip, my ticket was offered by friends living in San Francisco, and a motel room was reserved far away from the railway station of Concord. But the day of the concert, I was arriving from San Diego with a stop in Phoenix to catch the plane for San Francisco. And the plane had 5 hours late !!! I arrived in San Francisco with my suitcase at 6 PM, took the railway to Concord, arrived at 8 PM, looked for a bus to go to the Pavilion which is very far away from the railway station. I found a taxi, payed a lot for it, and arrived running like a devil, hearing The Gates of Delirium. I sat next to a guy and asked him what had I missed, I don't know if he remember me. And after the concert, everybody joined the railway station on shuttles, and I was left alone, found the same taxi and went back to my motel room. No diner, nothing. That was my experience of this concert. A big trauma in my life, to say the least. But if i didn't do it, i would regret it for the rest of my life ! Yes had lost Billy (who had seemed increasingly unneeded anyway), but didn't have a new album out. Therefore my expectation was for a retread tour of old material (as OYE had largely been), with Kansas as freebie opener. This turned out to be more-or-less the case, but I would not have guessed they'd choose this particular material! Kansas were visually more entertaining, due to their alternating lead singers; the keyboardist would come running up from his back position to take over from the violinist. The band seemed very comfortable onstage, with the violinist strolling about -- even, on one occasion, crouching down at the guitarist's amp to inch up the volume. His casual authority contrasted with the keyboardist's more urgent approach, and it was reflected in their vocal styles. An interesting band to see as well as hear, if more squarely in the rock corner than Yes (no country or jazz influences). Several in the audience happily sang along with their longer pieces, none of which I'd heard before. Then Yes came on -- less dynamic visually, perhaps, but much more so musically. On paper, the bands did the same thing: a six-song set of their most ambitious material, with their two strongest radio hits for encores (I have to wonder if Kansas would have dared to do such a thing on their own). The difference: the Kansas show was one hour, but Yes ran for two. And what songs! "Close to the Edge" to start! And "Starship Trooper" to follow! What could be next? Not -- "Gates of Delirium"! This wasn't a concert; this was a 'take no prisoners' blitzkrieg; I remember thinking the performance was mostly convincing -- not bad at all for the second day of the tour. "Leaves of Green" and "Heart of the Sunrise" were this show's equivalent of taking it easy before plunging into "Ritual", which built into a huge climax. Talk about stamina! I didn't know there was going to be a Masterworks tour. I thought they were touring the Ladder. The night before I had been telling my wife that there were songs I wish they would play but would probably never play again. The list included Gates of Delirium, anything from Tales, but especially the acoustic piece from side 3 (I'd seen Steve Howe perform it in a solo show - Leaves of Green? ), and Close to the Edge. What an incredible surprise when they showed up and started playing everything I had wished for, I couldn't believe it. The Gates of Delirium, done again with the Yes Symphony this year, is by FAR and AWAY the wildest and best thing I've ever seen done live in my life. I can't imagine something being more electrifying and gripping. The show was a little loose. Steve Howe got lost a bit during Roundabout (and how many millions of times have they done that?). I had to wait a week or so to put this YES show in perspective. I have a habit of letting my cosmic mind take a nasty egotistical turn on certain events in my life or the life I think I lead each day. So here it goes. I've never had such high expectations for a concert in my life. I felt like I was 16 again. I attempted to go online and buy seats for the show and was successful but I decided to check somewhere else just in case and when I went back I was unsuccessful in getting connected again. Instead I telephoned the box office and got the same seats on the other side. I purchased four seats for $55.19 each. Hey it was the Master Works Tour how could I loose. The day of the show came and I was so excited like I was performing or something. I arranged to meet three friends of mine at my place of work so we could leave right at 5:30 PM and make it on to the Bay Bridge by 6:00. Since it was weekday traffic it was at a total stand still and the 95 Honda Civic was as well. It was 7:00 and still waiting to get onto the bridge. My car decided to over heat and had to drive to a parking lot by Pacific Bell Park. My friends and I quickly booked our way to the nearest BART station and took a Train to the Concord station and then got on a shuttle straight to the Pavilion. It turned out to be a very tactile move. We got there around 8:30 and caught the last song on Kansas's set. No worries I didn't care very much in seeing Kansas's set any way. I was there for YES and YES alone. The weather was extraordinary. Not to hot and not too cold just right. 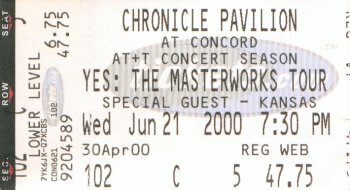 This was my first concert at the Pavilion and my first Yes show out doors. Our seats were impressive and worth every penny. The crowd was different compared to the Yes shows at Watfield I had seen in the past. There were lots of family's with kids between the ages of 7 and 14. The way the Pavilion was set up I kind of wished I opted for the seats along the lawn They were less expensive and the view was just as worthy as the lower levels. When Kansas finished their set the band crews hurried out on to the stage to change into Yes. We decided to get up and prepare our selves for Show Time. By the time we were finished and had enough beverages to tie us over for the show it was time to sit down. I was so loopy I almost sat down in the wrong seat. I think this is going to be the last YES show that I'm under under the effect. (NOT!) I finally found my seats and prepared my self for lift off. Every time I see a Yes show I play this game with my friend Pat. We try to guess what songs their going to open with. Since this was the second show of the tour we had no idea what they were going to play. I guessed Close Encounters followed by Going for the One then right into Mind Drive. Like I said I was totally Loopy! Kansas was very good. I caught their whole performance from the opening �Mysteries and Mayhem� right through to the encores mentioned in other reviews. �Dust in the Wind� was particularly beautiful as an acoustic piece (two acoustic guitars, violin, and a smattering of piano.) They were very, very good. I think they�re in for a resurgence of popularity as the material from their new album was well received. Most of the band left as Jon introduced Steve who stepped up to center stage. I finally got to hear him play the acoustic work toward the end of �The Ancient (Giants Under The Sun)�. I though he would segue into another solo piece, but he kept going right up to �Leaves of Green� at which point Jon joined in. Well, actually, Jon was a bit late and Steve played the melody for �do the leaves of green stay greener in the autumn� at which point he paused, nodded to Jon and started in again with Jon singing along this time. I had never heard them do this song in person before. It was probably the most magical point in the whole show. The audience enjoyed it and, much to my surprise, actually clapped along in rhythm. This was an odd treatment for such a classical styled piece but one that made it very personal for this crowd. After this, a friend that I�d come with said that he hoped to hear more of Topographic Oceans later on. Having seen the previous night�s set list, I knew he would get his wish. Just a quick review on last night's show in Concord (ca). As a Yes-Fan it was quite overwhelming to finally get the chance to hear the masters do the long awaited songs that haven't been heard in years and I wasn't gonna miss a note!. Yes hit the stage in a quick fashion and opened with the beautiful sounds of the birds chirping to begin the opening number "Close To The Edge". For me, it was a religious experience of sorts as the song has so many emotional ups and downs, it's hard to express the ways one can feel about a particular song for so many reasons. When Steve and Jon performed "Leaves Of Green" together, there was a moment when I really thought that i'd died and gone to heaven!. I don't remember clapping so much for a band ever!. I thought the high part of the evening was "Ritual" Again, it seemed as though most were unaware of the song and Jon urged us all to get up and dance at the end of the song! Igor was in charge and seemed to be very confident about his playing as he was having some fun interacting with Alan and Chris all night. What can you say about Steve other than he's quite the player and after watching his fingers at work, I don't know of a player that works as hard as he does!. (And I listen to many different gutarists!) Chris was his old-self prancing around the stage having a great time interacting with the band and the fans alike. Alan seems to be like alot of drummers that I know of, hidden behind a huge kit and keeping the rythym section in tact (too bad he wasn't closer so that we could see some of his techniques!.) And then there is Jon, what a stage presence!, What a blessing to see the maestro up close and get a chance to witness one of the greatest singers/songwriters of our time!. I know i'm leaving-out a few songs but, I just had to write about my experience at the show and let anyone with any doubts about going to reconsider and buy some tickets when the band is close to your town!. Like I said before, it was like a religious experience for me and I just hope that Yes blesses us with another appearance in the bay area real soon!. 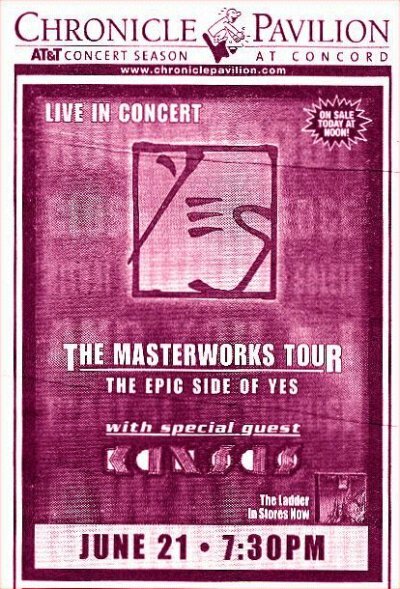 I include the Kansas set list because I've never seen anybody open for Yes before and Kansas played a very worthy set. Robby Steinhardt (violinist for Kansas) told me backstage that the Kansas set was put together with the Yes crowd in mind. It does feature some of their older, less conventional material. The fugue-like "Questions of My Childhood" and the beautiful "Hold On" being the dramatic high points of the show. The Magnum Opus instrumental would have been well-received in its 10-minute entirety but they were on a tight schedule and still had some bones to throw to the Kansas die-hards. Robby apologized for the time constraint and said that they wouldn't have time to play "Close to the Edge". Pretty funny. I guess you had to be there. I would love to hear them try! And then Jon could sing Dust in the Wind! But I dream. Sure, we're all there to see Yes, but few were left in their seats by the end of "Carry On." Don't be late to this show! I was still backstage for the first part of "Close to the Edge" (with Igor exhorting us to hurry up, we were about to miss part of the show). Um, well done. Jon didn't back off of "I Get Up, I Get Down" at all. The organ parts were beautiful, but most of the other, more synthetic keyboard tones were backed off just a tad too much. You couldn't quite make out the notes of the faster runs. So that was good and the vocals really impressed my wife who was at her first Yes show (Yeah, I know, not taking her to one sooner should be considered abuse). The "build" at the end of "Starship Trooper" was awesome. The guitar wasn't as crisp as I would have liked at the beginning but once Chris started shaking the floor on the low end, you're just along for the ride anyway. Things got hazy after that, but I do remember being giving high fives at the end to other exhausted fans. The review of the show in Reno the night before mentioned that "Gates of Delirium" was sloppy. Maybe it was. I've only heard the "Soon" part of that song before. But Steve's pedal steel work was anything but sloppy. This should be required listening for everyone who plays that instrument. And I cannot really put into words the sound of Steve's notes dropping out of the sky, Jon's guitar carrying you forward, and his voice melting the world. Every song makes you feel like the show was peaking but maybe it was here. You just about need Steve to take over the show and slow it down with an acoustic guitar clinic called "Leaves of Green." I'd never heard that song before but I could have handled of whole set of just Jon and Steve. Beautiful stuff. If you play guitar, don't watch Steve's hands, it's quite discouraging. Jon talked for a bit here about "doing this kind of tour" and how it had to include the singing of "Heart of the Sunrise." It's gratifying to see someone as peaceful as Jon enjoy themselves so much. It was infectious. This is a good song and maybe the best technical performance of the show. Everybody was sharp and dead-on. It was like everyone wanted to steal the show on this song. No way to pick a favorite performer. Yeah, just got back from the show and I'm buzzing. Yes is just such a professional group of musicians I can't get over it. To play Gates like that after 24 years. Not to get off to too much hyperbole but that was close to a stellar rendition of Gates. I spent the first 5 minutes of it half way nervous that they would simply not be able to pull it off following relatively little practice. But it was done well. And I imagine it will only get better. Ritual was also also strong. Commendable drumming. Nice to hear that tune. CttE, of the 3 biggies, I would say was the weakest (but certainly far from weak) Maybe they weren't warmed up. Starship Trooper was nice as always. HOTS was done well, but I'm not a huge fan and I'll forgive them for Roundabout, although one of my main goals in life is to see Yes when they don't play that tune. It was the same setlist as Reno except they added isAgp. Anderson's voice is as always and Howe is amazing on the complex guitar parts on Gates of Delirium. Note perfect and only slightly off in timing in a spot or two which is really remarkable after so many years of not playing it. O.K. all you kids, go see the show. Part of my perceiving the two concerts differently is going to be due to a different seating. At Reno, I was far Howeside in the 2nd row, while at Concord, I was far Squireside in something like the 14th row. The Concord show was LOUDER - I have some tintinabulations buzzing through my ears right now 9 hours later. Overall, the performance improved a good bit. I think that you folks that will be catching this tour later will be the luckier ones. Gates still ran into the most rough stretches, Ritual was still the highlight. ISAGP was added to the encore. "Your Move" was started as a Jon solo - vocal and guitar; it was rendered in a much more simple fashion than when Steve plays it (duh!) but it had a decent amount of "charm" value. I said that Jon seemed a bit "restrained" in the vocals at Reno, perhaps a better word would be "conservative". I'd also say that of the Concord show. It's not an important negative impact on the show, but don't expect him to pull out all the stops and blow his pipes for "Soooooooooooooooooon...", OK? No fireworks tonight, but now there were a few stage decorations in the form of shiny white cloth triangles in back, billowy cloth overhead, upon which nice lighting effects were played. Concord Pavillion is a great venue. We were pretty close on the Squire side of the stage, and we could see everyone quite clearly. Kansas opened a few minutes early at about 7:24, and played a good set to the people who had taken their seats early. The surprise of the night was the stage backdrop that started going up soon after Kansas left the stage. At first I thought it was a Dean-esque canopy, similar to that used in the "Crab Nebula" stage set, but as it rose it revealed itself to be individual white triangular pieces of material fastened at the corners like sails, in an overlapped layered fashion. With the stage lighting illuminating the sails with different colours, it looked pretty spectacular. Full marks to whoever thought this one up. They walked on to the stage to the sounds of Britten's "Young Person's Guide to the Orchestra" (I think) and kicked of with a superb rendition of CTTE, with Igor nailing the keyboards really well. ST was next, where Steve really shone. When the final notes were fading away, a large bunch of the audience were chanting "Steve! Steve! Steve!" and he deserved it. Steve came out with his acoustic for what I assumed, somewhat surprisedly, was going to be "Clap". Turned out to be LOG. Simple, clean, beautiful. Another surprise was next: HOTS. Chris did his thing on the bass, everyone loved it. Well executed. Then.. Ritual (NSDS). 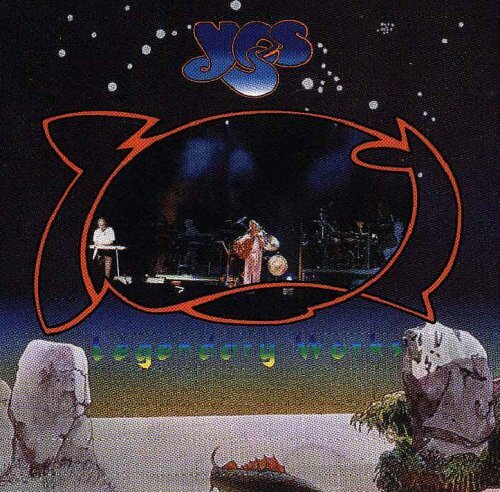 I have to confess that this is not one of my favourate yessongs, but when played live, Chris's bass solo coupled with the percussion movement makes up for it. Truly awesome. A worthy finale to the first set. Oh dear. For an encore, the old favourates were trotted out: ISAGP followed by Roundabout. Yet, YES won me over again. Even though I really didn't need to hear these live, the band is just on fire. I danced and clapped and sang with the rest of the crowd down the front. It was a gorgeous evening in northern California to see a concert, even if it was a week night. Kansas walked on and started at 7:30 sharp and went off at 8, then returned quickly for three encores (Dust in the Wind is truly a Bic lighter moment). They were extremely warmly received by the crowd which was nice. Yes went on about 9. The setlist is the same for Reno except that the encore began with I've Seen All Good People and ended with Roundabout. The band: There's great chemistry and energy on stage. The band are very loose and relaxed and yet focused at the same time. There's something special happening that I don't think I've ever seen. A killer instinct seems to be finally re-emerging after all these years. Maybe getting back to a 5 piece is part of the reason. Steve was on fire most of the night, especially for Close to the Edge. He blew through his entire part which was amazing to watch. I think maybe the red Les Paul is easier for him to maneuver on. He also let his guitar tone get a little dirtier which allowed the solos to have much more heat. All around a great performance and more ballsey than I've seen him in recent memory. Jon nailed his vocals all night long, even occasionaly taking the part UP when diverting from the recorded melodies. I am simply amazed at his vocal prowess. Chris was a major stud. He's obviously in the best shape he's been in ages and it's reflected in his performance on stage. He tore into the pieces without reverting to excesive hammery and finally displayed the Chris Squire aura of old. Did I say killer instinct? Igor seems to ingrain himself deeper into the fabric of the band with each successive tour. He and Chris has a couple of nice moments playing off of each other. And of course a great performance. Alan was the only person hard for me to read. His playing seemed to lag in a couple of places, including the percussion solo in Ritual. It seemed an effort for him to keep up occasionally but nowhere did he blunder. I just hope he's eating his Wheaties! The performance: Excellent overall. A nasty timing flub at the end of Chris' solo in HotS and another toward the end of the song were the only really noticeable gaffs. There were a couple other minor misteps here or there but overall the band were in great form. Gates actually had me misty during Soon. To see the band obviously working their asses off to make it happen out of sheer determination and desire was very moving. I would not want to be in their shoes for that one. Ritual was great and sooooo much better live. It works amazingly well for non-Yesheads. Chris still needs to smooth off some rough edges but it's so cool to see him use the Yesshows solo. The percussion jam will be one of the defining moments of this tour. I've Seen All Good People: It appeared at the end of Ritual that Steve's amp had blown or something. So when Jon came on with an acoustic for the encore and mumbled something about improvising, I was wondering if he was going to have to try a solo piece and then call it a night. The audience eagerly joined the sing-along and the vibe was magical. The rest of the band gradually joined in and it played out as usual. I still don't know if it was planned that way or not but it worked fine anyways. I came really to Gates and Ritual and neither dissapointed, despite the obvious struggle just to get through Gates in one piece. Soon was probably worth the price of admission alone. A final note: Don't be afraid to bring non Yes fans to see this show because of the setlist. The charisma of the band and the sheer awe-inspiring impact of their performance will make it worthwhile. Same as Reno, with the addition of All Good People before Roundabout. What a show! For me, just as moving as the SLO shows!!! No Firebird, straight into CTTE's birds chirping to start the show! Starship Trooper what a jamfest!! I swear Steve and Chris rule!!! Gates!! Brought down an octave (ala GFTO at SLO) Jon didn't have to scream at all. This song will last the duration of this tour!!! Absolutely incredible! Ritual!!!!!!!! Chris is insane!!! Great solo/showmanship!!!! Love it!!! When they were all banging away on the drums, I could barely contain myself :) !!!!! Steve- had no problems whatsoever a+. Jon- fantastic!! chopped his ponytail. great to see/hear him doing rhythm guitar again!!!! Chris- a master at his craft!!! ritual!!!!! Igor- with billy gone, seems like the weak link. can he really play? or is he under severe political restrictions? This is the Yesshow I bought all those tickets over all those years hoping to see!!!! CttE: Too slow for my liking but the guy sitting next to me said it was much better than the previous night in Reno. Harmonies sounded really good. What a way to open a show. ST: This one rawked. Looked like Steve and Chris had a couple moments of confusion, but nothing major. GOD: WOW! WOW! WOW! Since this was the first time I had seen this one I have nothing to compare it to. I thought it was perfect. Steve seemed to flub some of the early guitar parts, but the pedal steel was flawless. Huge ovation after this one. HotS: Very well done, but I would have rather heard something from Tormato or Drama. Ritual: WOW! again. Igor is such a ham. Steve had some brief sounds problems near the end, but otherwise superb. I did not stick around for the encores. I was seated second row basically dead center just a couple of seats away from Jane. She certaily is a lovely woman. Where I was sitting the sound was good, but being so close I really couldn't hear anything from the mains. I could tell that Chris was just booming though. Steve actually smiled five or six times and barked at his guitar tech a couple of times. Those of you seeing this show later in the tour after they get some of these songs polished up are in for one hell of a show. Thank you so much. It's great to be here with you this evening, thank you. One of the important songs we decided to do on this tour, we're going to do it now. It's a song we haven't played for 24 years. I call this song 'The Gates of Delirium'. Thank you so much, thank you. I wish you could take more tours with us [???] easier. So, I mean, this is the second of our concert tour and really appreciate you coming this evening and supporting all [???] based in the sentences we appreciate very much. Steve Howe, on guitars! We're going to carry on with a song which when we started thinking about doing this kind of a tour we wanted to sing this song very much and the idea is that we all come from the 'Heart Of The Sunrise'. Chris Squire! Bass guitar! I mentioned this to a friend of mine, actually, was me and my beautiful wife Jane [???] we met this wonderful lady and she told us, very strongly about how, the earth really listens to human beings and I thought that's very logical and..uh [???] very strong energy force when people get together to listen to music, doing things together in groups. And she said, "It's..it's kind of like a Ritual". I said "That's interesting", 'cause that's one of the, one of the pieces of music we're going to do on this tour. It's called 'Ritual'. And she said, "Well you should do it for the earth, you know, for human beings and the Earth." So if you feel like stamping and dancing around when we do this, especially towards the end, please do it. So here we go. A song from 'Tales From Topographic Oceans' called 'Ritual'. Mr. Igor Khoroshev on keyboards here. He paid me fifty bucks to say that. I'm actually going to play the guitar, and this is a sort of improv situation, believe me and I'd like to introduce you to the greatest, greatest guy in the world and great drummer, Mr. Alan White on drums here. So I was..uh I was sitting with my son about a month ago, and I was playing him some chords. I said, "Say they're very nice chords, dad. What does it mean?" And I said well, I wrote this song, it goes, "Take a straight and stronger course..."